In modern copy machines, the toner cartridges and toner delivery systems are designed and intended to function in such a way that there is no human contact with the toner. The reality is, however, that the copy machine operators do come into contact with toner. 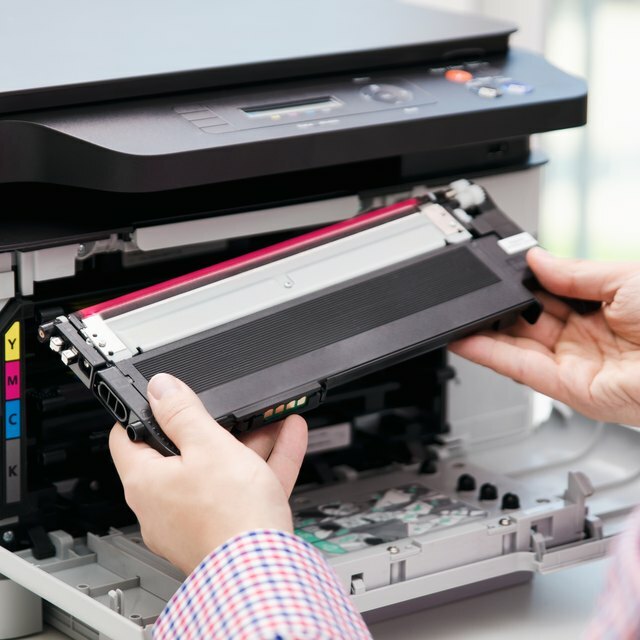 Cartridges malfunction, components in the machine break exposing toner to the environment, and there can be unfused toner on paper pulled from the machine when clearing a paper jam. These are ordinary ways that a copy machine operator can be exposed to toner. Toner is fine powder made of polymers and pigments. In very simple terms, it is plastic powder. How fine the particles are depends on its use. A high-quality, photo printer toner will be very fine and a toner for a low-end copy machine would be quite coarse in comparison. Toner is not considered a carcinogen, though it can be an irritant. Ordinary safety precautions apply. If you get toner in your eyes, flush the eyes with water to remove the particles since particles even of benign substances will irritate. Toner on the skin should be washed off with soap and water as soon as is practical to do so. Don't eat or smoke until you've removed yourself from the environment and washed the toner off. Brush toner off your clothes with a dry cloth or a clothes brush, then wash the clothes in cold water to remove toner that couldn't be brushed off. Don't use warm or hot water since toner is set with heat and will make a permanent stain on the garment. Wash in cold water until the toner is completely removed from the fabric before drying the garment. Wear a particle mask to prevent the toner dust from being inhaled. As with the eyes, even benign particles will irritate the respiratory system. Gently sweep up toner that is spilled. Treat the toner like flour. It is a fine powder and will hang in the air and gradually settle onto all horizontal surfaces if disturbed in a vigorous manner. Sweep slowly and deliberately so as not to puff dust into the air. If a vacuum cleaner is available with a microfilter capable of handling the fine particles, you may vacuum. If in doubt, use a broom or dust brush to clean up the spill. Dispose of the toner in a plastic trash bag, then gently and deliberately tie the bag closed. Be careful not to squeeze the air out of the bag too vigorously, or the toner dust will escape the bag and puff into the air. Dispose of the trash bag into a second trash bag, which can then also be tied closed. This double bagging will better ensure the toner does not leak out of a single bag, and it will prevent the vigorous disturbance of the toner lest something be tossed into the trash on top of it. Toner is not hazardous waste and so can usually be put out with the regular trash. It is not a good idea to reuse toner that has been spilled since the toner delivery system in the copy machine would be contaminated with foreign particles cleaned up along with the toner. All toner manufacturers print a Material Safety Data Sheet (MSDS) for each type of toner it makes and must make them available on demand. This MSDS documentation can be obtained directly from the manufacturer or from the supplier that sold the toner to you. Ask for a MSDS for each type of toner that is used in the office equipment you come into contact with or go to the manufacturer's website and download the documents. These data sheets provide very good information for consumers regarding product composition, hazard identification, first aid, combustibility information, handling and storage, and cleanup. Allyn Bowker, field service technician; Vancleave, Miss.